Get to know your full list of terms with our handy glossary. Made from a silvery-white, soft, nonmagnetic metal, aluminium venetians are a popular style of blinds for kitchens, bathrooms and living areas. Lightweight, sleek and water resistant, they offer fantastic functionality, understated style and long term reliability. Our range of aluminium venetian blinds is available in four modern colours: charcoal, white, silver and alabaster. Linden trees produce a soft and easily worked timber known as Basswood, which has very little grain and a strong density. It is lightweight, strong and stable, and frequently used in the design of Venetian and slat style blinds. A handy tool from Zone Interiors to help you find the right blinds, faster. Simply choose which room you’re looking to fit out, your preferred colour tone, the desired privacy rating, and the type of material you want. Within seconds, you’ll have a list of the most suitable options that meet your personal requirements. The amount of light reduction that a set of blinds can provide. The higher the light block out factor, the more effective the material is at blocking sunlight. Block-out blinds are ideally suited for bedrooms and living areas where privacy is paramount, because they can offer cover and darkness for ideal sleeping conditions at any time. The bottom or base rail on a set of blinds is the lowest part of any blind, usually containing that assists in raising and lowering the blinds. For example, the very lowest (and often the thickest) slat on a set of timber Venetian blinds. It contains extra space to store the vertical hanging cord that interconnects all of the other slats. Horizontal-hanging blinds are mounted using this mechanism. It usually looks like a small cube with holes punched into the sides, hence the name ‘box’ bracket. The blinds slide into the bracket and a hinged flap secures it into position. Box brackets will either be attached to the inside of the window frame or on the outside of the window, depending on your preference of mounting style. A more modern style of horizontal blinds, called cellular because they’re made up of repeating, honeycomb shaped cells. Refers to the amount of depth available and/or necessary for mounting your blinds correctly. The cord lock is the mechanism that enables you to fix your blinds at a certain height within the window frame. This refers to an alternative style of slat control. Rather than using a conventional lift cord to control the height of blinds, cord safe design features a push-button lift retraction. It is designed to eliminate cords for added neatness and improved child safety. Curtain rods are poles that run horizontally along the top of a set of curtains. They provide a fixation point for the curtain material, and often feature stylized decorative end caps. End caps are placed on either end of the bottom rail to conceal the space required to house the mechanism that sits inside. They’re usually colour matched for seamless coherence with the rest of the set. An extension bracket is used for an outside mount where the window frame protrudes too far off the wall to allow for proper clearance – disrupting the fit of the blinds. The extension bracket is an ‘L’ shaped device that creates greater distance from the wall, allowing the blinds to easily clear the window frame and attach to the wall more securely. The head rail is the uppermost horizontal panel of a set of blinds. It is usually hollowed out to house all of the mechanisms that help in lifting and lowering the blinds. An inside mount is a method of fixing a set of blinds to a window frame. Inside mounts offers a minimalist, streamlined look, with the blind system contained fully within the perimeter of the window frame. You may get a stream of light coming through on either side of the blind, due to the spacing that’s required to accommodate brackets. An important tip if you’re considering an inside mount: make sure that you have no obstacles that could disrupt the flow of the blind, including larger window sills and window winders. Zone Interiors blinds can be cut-to-size for a custom look, without the custom price tag. A lift cord refers to the thread that runs vertically down the length of a set of blinds from the head rail. It often has a plastic or wooden end piece, and is used to control the height of where the blinds sit. Light filtering blinds offer enough thickness to block views, but are opaque enough to allow decent levels of sunlight through to brighten up a living space. They are ideal for frequently used rooms where privacy isn’t necessarily paramount, like a lounge, study or rumpus room. A style of Zone Interiors Venetian blinds made from western red cedar. An outside mount is a method of fixing a set of blinds to, or above, a window frame. With an outside mount, the blind is mounted either on the window frame itself, or entirely outside the frame on the wall. Combined with a pelmet (the narrow border of wood running along the top of the blind, to conceal blind mechanisms), an outside mount provides a simple and professional finish, and offers greater flexibility because the sizing of the blind isn’t as important. A pelmet, is a form of window treatment that covers the uppermost part of the window to conceal any mechanism or railings that are necessary for blinds or curtains. Most sets of blinds will come with a standard pelmet that matches the colour and material of the set. The shorthand form for polyvinyl chloride, a synthetic polymer that has high hardness and durability. It is regularly used in the manufacturing of Venetian blinds and is ideal for wet areas due to a high moisture resistance factor. A length of full fabric on a roller mechanism that can be adjusted to different heights. We offer two types of roller blinds – block out and light filtering, in a variety of fabrics and colours. A popular style of blinds that uses a thin woven cord ‘ladder’ system to hang multiple slats via lengths of fabrics. The slats can be raised and tilted to various degrees, enabling unrestricted privacy and light control. A wand tilter is the long plastic rod, attached to the headrail, which can be rotated to change the angle of the slats in a Venetian set of blinds. Rotating the tilter in one direction will open the slats, allowing for greater levels of light and a clear view. Rotating the tilter in the opposite direction will close the slats, blocking out the light and offering improved privacy. Western red cedar is a large hardwood that grows in the coastal rainforests of eastern Australia. It is soft, polishes well and has good workability, making it an ideal material for decorative applications. 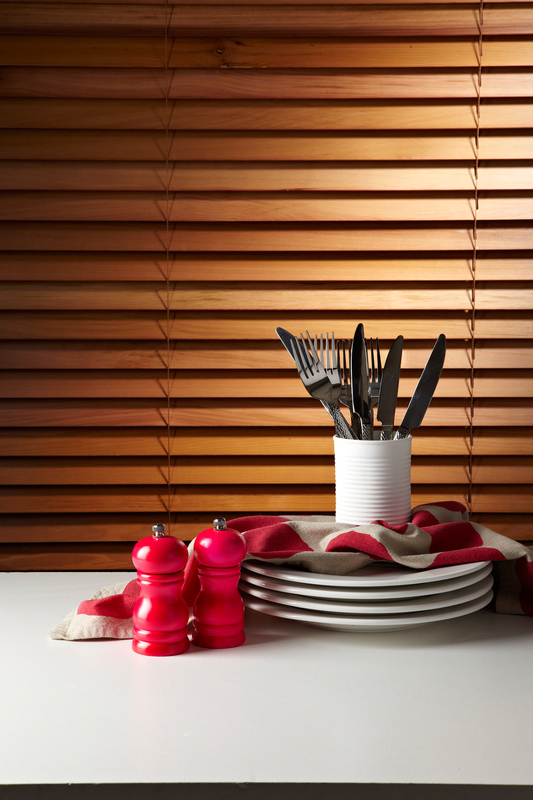 Our Madison range of Venetian blinds is crafted from western red cedar.